Ah, what to do about wrinkles, the tell-tale sign of aging? First, it’s best to try to prevent wrinkles, but by the time most of us think like that it’s probably too late – the wrinkles have already appeared. If those nasty wrinkles have started to appear Verisol may be the answer you are looking for. Two fairly recent clinical studies, both published in Skin Pharmacology and Physiology, showed that collagen supplement called Verisol improved skin elasticity and reduced wrinkles around the eyes 20% and up to 50% in some women. The studies involved a total of 200 women and lasted 8 weeks. These were double-blind randomized control trials (the strongest type of study). Verisol is an oral supplement containing bioactive collagen peptides. Collagen is a major structural component of skin (making up to 80% of the dry weight of skin) and other soft tissues. 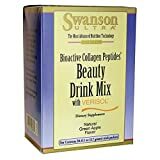 The collagen peptides in Verisol are able to penetrate deep into the dermis of skin unlike topical collagen skin creams which penetrate the epidermis or first layer of skin. IMPORTANT NOTE: This product is made from bovine which some individuals may be allergic. Please consult your Doctor before consuming. Collagen Peptides is a Protein and Individuals who consume an excessive amount of Protein in their diet may experience bloating and diarrhea. In addition to stimulating collagen production, Verisol increases skin moisture delaying the onset of wrinkles. The effects of topical collagen creams are short lived and they need to be applied daily to maintain their effects. Until now oral collagen supplements were ineffective because the peptides were broken down in the stomach before making into the circulation and delivered to the skin. However, Verisol is more bioavailable. This means it is absorbed by the gut and makes it way to the skin where it can repair damaged skin. Reduced wrinkle volume even after stopping Verisol for 4 weeks is considered significant by researchers and suggests it has long-term skin benefits in contrast to topical collagen. Wrinkles occur for several reasons but a major one is the breakdown of collagen in the dermal layer of the skin. Collagen is a support protein. In the first study 114 women ages 45 to 65 to Verisol for 4 weeks revealing an average reduction in wrinkles of 20%. They then stopped taking Verisol and were re-evaluated 4 weeks later after and wrinkle volume was still reduce by 11.5%. In the second study (linked to above) 69 women ages 45 to 65 took Verisol for 8 weeks. Verisol improves collagen production improves up to 60%. Skin elasticity also improves up to 15% after just 4 weeks of using Verisol. An added benefit of Verisol is it can reduce cellulite which affects 85% of the female population. Such benefits may take up to 3 to 6 months but these cellulite benefits may be limited to women with normal BMIs of under 25. Verisol also improves growth and health of nails. Studies show a decrease in chip and cracked nails after 2 months reaching 42% reduction at 6 months. The maker of Verisol makes no claims for any hair growth benefits. Verisol can be obtained online. One product that contains Verisol is Swanson Ultra Beauty Drink Mix with Verisol. Life Extension also sells Verisol. And, of course there is always Amazon. Consider eating collagen boosting foods like soy, omega-3s, and lutein-rich green vegetables. A healthy diet is a key to healthy looking skin. Will go and buy thus hair, skin, and nails with verisol at my earliest convenience.